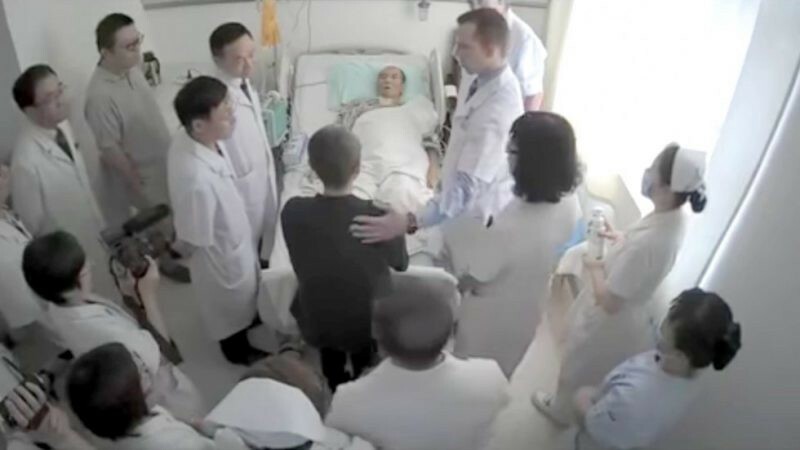 Chinese dissident and Nobel Peace Prize winner Liú Xiǎobō 刘晓波 is in critical condition in a Chinese hospital, the South China Morning Post reported today. A medical team is on standby to resuscitate him if necessary. Liu, 61, was diagnosed with terminal liver cancer and released from prison on medical parole in May. One of the principal authors of Charter 08, a pro-democracy manifesto, Liu was arrested and convicted in 2009 on charges of subverting state power. In 2010 he was awarded the Nobel Peace Prize. The Chinese government had ignored international appeals for his release until his health deteriorated earlier this year. Since May Liu has been treated in a hospital in Shenyang, Liaoning province. His condition rapidly worsened last week. Two foreign doctors recommended he be flown to an overseas hospital for more aggressive treatments, but his Chinese doctors claim he is too weak to be moved. This quote from the South China Morning Post suggests it is the government that has advised against moving Liu, however.